I’ve told the story before about my Grandmother Ruby Wilde who was emigrated very unwillingly to Canada with her mother in the early 20th century. She was only six years old and had been raised by her grandparents. Her mother worked as a housekeeper in a large manor house about thirty miles from Shrewsbury and only visited occasionally. There was no father’s name on the space for it on Ruby’s birth certificate. To further add to the mystery, when Ruby was six, her mother was discharged from service at the manor house and paid to leave England. The further twist in the tale was that it was specified that she must take her child with her. Ruby did not want to go and begged to stay with her grandparents, but to no avail. So hasty and unplanned was this departure, that Ruby’s mother flipped a coin to decide whether she would emigrate to Canada or Australia! It seems pretty clear that there was some connection between Ruby and those who lived in the manor house but it is impossible to know for sure. I do know that Ruby left England very unwillingly, and sadly never returned. Aged only 62, she died wanting desperately to visit her home one last time. Some of her passion for this country seems to have passed genetically to all of her grand-daughters and has already brought two of us back to England to live. It’s also given us all a real soft spot for Shrewsbury itself, a beautiful market town near the border of England and Wales. It is to Shrewsbury that I am heading with my husband and son this weekend. We will be sightseeing and also having a visit with our wonderful cousin Noel. Noel’s late wife, Barbara continued a correspondence begun by my Grandmother Ruby with her grandparents many years before, and that correspondence was in part responsible for me ending up in England. He is a lovely gentleman, and it will be so nice to see him again. You see, after my Ruby’s Grandparents passed away, she stayed in touch with her cousins. The cousin she kept in touch with the most was named Albert. He had two sons named Alan and Noel. When World War 2 raged, Ruby saved her ration coupons and sent food packages to Albert and his family. After the war, Ruby kept up her correspondence with the family she had left behind and after Ruby’s death, her daughter (my Mom) wrote to Albert to tell him of her mother’s death and the correspondence continued. When I was old enough, I began to write to Albert as well. It was really mostly thank you letters for the wonderful packages he used to send me full of games and toys different to any I could find in Canada, but I loved to write letters so these developed into a correspondence of their own. After a time, Albert too passed away, and it was his son Noel’s wife who wrote to tell us of his passing. I still loved writing letters, so I replied to her and the correspondence continued. In 1985 we travelled to England and met our them. I loved England so much that after another visit in 1987, I emigrated. The rest is history! I’m looking forward to exploring the place my Grandmother came from this weekend. I have not spent that much time there so every visit I see something new. I also hope to visit Shrewsbury Abbey this time. 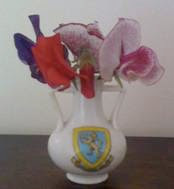 It is where the vase in the photograph above came from. It was my Grandma’s. I don’t know if she took it with her when she emigrated, or if someone brought it over for her later, but I’m very keen to see the place it came from. I also want to go to the Dingle, where we scattered my Aunt’s ashes last Autumn. We are going to be staying at a lovely old hotel, very historic and reputedly one of the most haunted hotels in England. Sounds like an adventure to me!